I’m always asked if I bake or cook because I write so much about food. I do cook. I do bake. But really it’s my family that are the star bakers. My mum is Russian and has ensured that our culinary history has been rich and varied. When we came home from school dinner would be Kotleti – oat-rolled meatballs in a rich tomato sauce – or stroganoff. For hors d’oeuvres at parties she’d make tiny Piroshki pasties filled with mushrooms and onions that we’d try and pinch pipping hot from the oven. 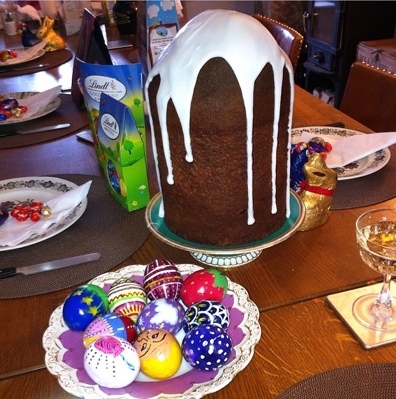 And at Easter we always have a traditional Easter bread called a Kulich served with Paskha (a sort of sugary, raisiny cream cheese) and of course, all the hoo hah that goes with making both! The success of the Kulich depends on the sweet bread rising super high – sometimes to over a foot. The dough spends the night in the airing cupboard and we all cross our fingers when it’s baked on Easter morning – hoping and praying that the bloody thing will rise so there won’t be tears over breakfast. One year we sliced the top off and the whole inside was an air bubble – disaster! The night before Easter we always paint eggs. It’s a beautiful tradition. We cover the table with newspaper, put out paints and a bowl of hardboiled eggs, and we sit round the table with wine and all try and come up with an idea worth painting. I’d recommend it as a tradition – because you’re concentrating on the painting, the chat is really relaxed and there’s loads of laughter. Probably a bit like a sewing bee! If I look back at my childhood, a huge part of it was spent in the kitchen… From whipping up cream for meringues – sniggering when my mum swore because the first batch had burnt – to sieving raspberries for coulis or jabbing holes in the top of the lemon cake for the sugary syrup to drizzle down. So to answer the question of do I bake/ cook. Let’s say I grew up as a very good sous chef! I listened, I observed, I chatted, I got evil stares from my sister when I ducked out of making dinner – and that’s probably why I’m better at writing about food now than cooking it! This entry was posted in Uncategorized and tagged baking, bank holiday fun, chocolate, easter, easter traditions, food blog, painting eggs for easter, romance author by jennyoliverbooks. Bookmark the permalink.